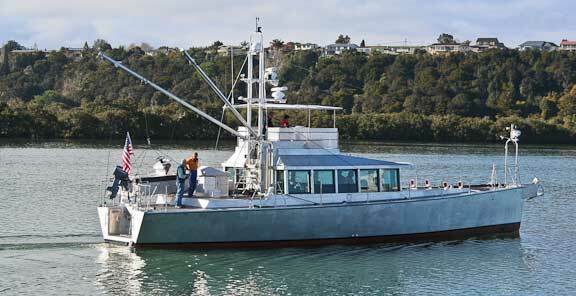 Sea trials for the second FPB 64, Sarah-Sarah, are coming along. She now has 25 hours on her engine and she will shortly be ready to turn over to her new owners. So far the punch list is short. We thought a few photos might be of interest. 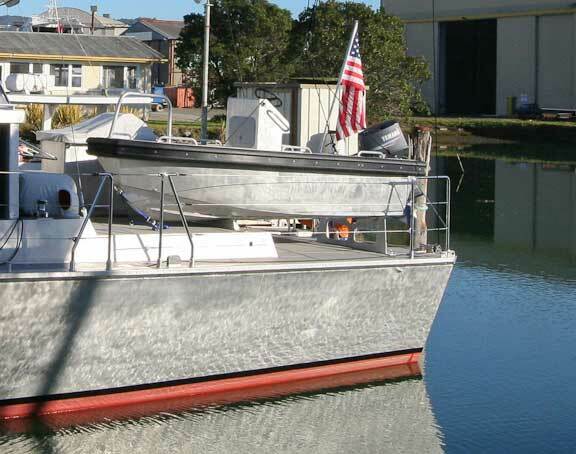 This is the first FPB 64 to carry the Circa aluminum tender. It looks like it belongs aboard. 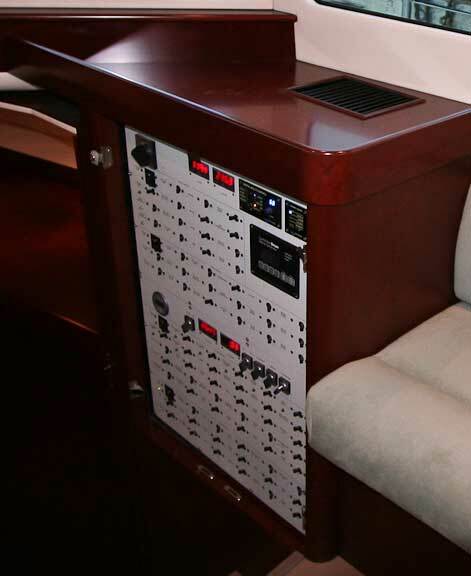 The basic layout is similar to the first FPB 64, with a few mods on the electronics end to suit the owner’s requirements. The helm design on Avatar has worked quite well and been retained with Sarah-Sarah. 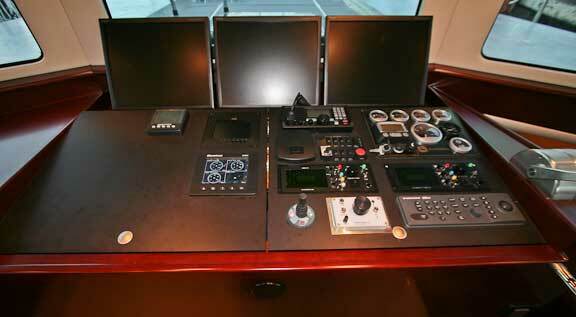 There is plenty of space for the logbook and reading material on the desk surface, and adjacent to port. The AC breakers, genset and inverter controls, and DC breakers which might require operation from the helm are close by. You have seen the office already with the first FPB 64, so we will keep this brief. The long range radio and satcom terminal communications gear is based at the forward end. There is a case to be made for it here, and another to keep it at the helm. We’ll finish up inside with a shot of the sea rails for the induction stove (the glass top of the induction stove is very slippery). A couple of photos now of the flying bridge. 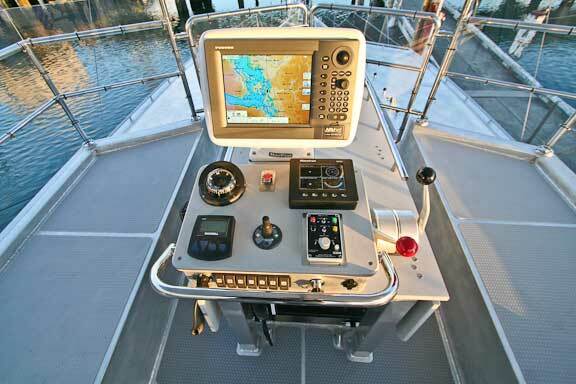 The one change here from the first FPB 64 is to move the autopilot steering control closer to the shift/throttle. Circa did a nice job with the Nav Net monitor support bracket. The forward opening “gates” are now angled in line with the windscreens, creating a touch more space. Rigging details on one of the two booms. And finally, the working level of the forward mast. 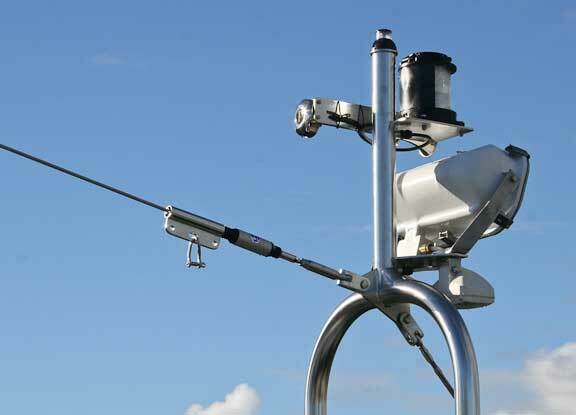 The slider on the “headstay” is for use with the get home sail. Shortly we’ll have more photos. 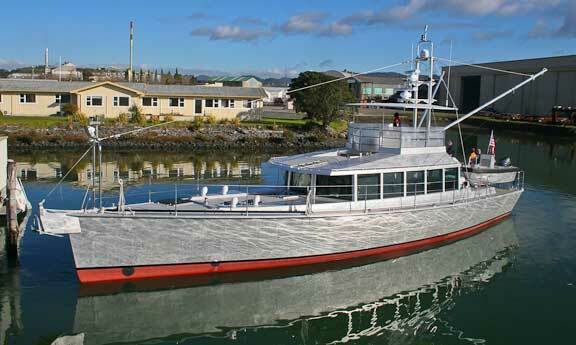 This entry was posted on Wednesday, July 28th, 2010 at 12:00 am and is filed under FPB 64 Sea Trials. Both comments and pings are currently closed. I noticed Avatar and Sarah-Sarah don’t have the international orange reflective tape on the booms or mast. Wasn’t that a “good idea” on Windhorse? Also, Have you tried some silicon pads on the induction cooktop? Keeps the pots from sliding, protects the surface from scratchs, and the pots heat like they aren’t there. We like the rescue orange, but it is a major aesthetic issue as well as functional, so this is an owners decision. looking fwd to further photos. working hard to spot individual differences in personalities. Congrats on a great new line of boats, wish I could have one. One thing that keeps ‘bothering’ me is the seemingly antiquated (and cumbersome) use of dual-lever controls. Are you running cables to be totally fool-proof, or are they wired? If wired, I can’t imagine why someone would forego the convenience of single-lever control. Just curious, I always like to hear your side of something I don’t follow immediately. And it’s an interesting juxtaposition, considering you go without steering wheels in addition to the other ‘norms’ you’re breaking. Thanks again for the detailed site, and keep up the good work. The controls are the subject of much debate and soul searching. 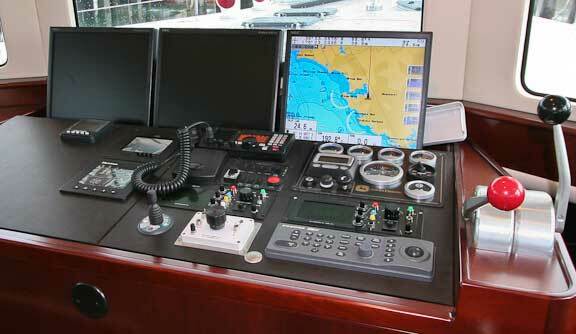 The Hynautics system is very costly compared to electronic controls, but 100% bulletproof. The electronic systems are less reliable. With dual engines you need the electronics for maneuvering, but you don’t with single engine. Hence, the decision to go with Hynautics. Avatar is in Vanuatu just now – but I suppose you already knew that. 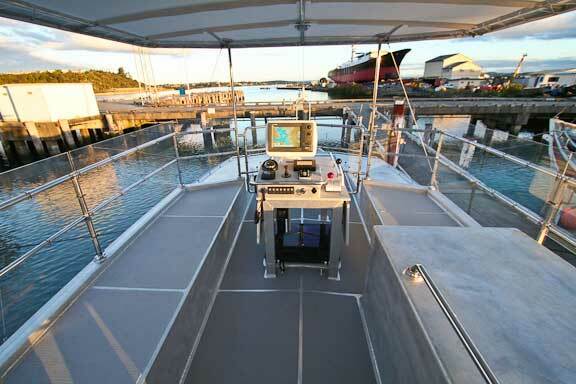 We saw her at the Yachting World marina in Port Vila on 30 Jul 10 – she was on a mooring. 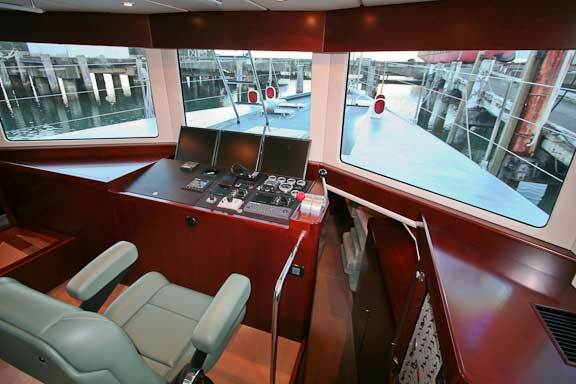 Her tender is very impressive – the biggest and best at the tender dock. Our old Zodiac was ashamed to tie up beside her! But there were a lot of old tenders there too! I am curious what the electronics changes are as compared to Avatar and the reasoning behind them. Which do you prefer and why understanding that the owner of Sarah-Sarah can use what he/she likes. Thanks and keep your excellent info coming. FPB 64 #2 has the NavNet2 rather than three. A more proven, glitch free design at this point. 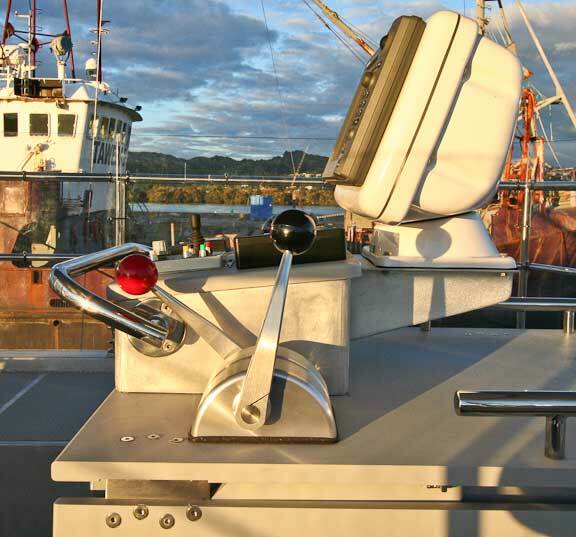 Rather than install the searchlight sonar the owner has used the standard sonar pipe to high powered depth finder. The rest remain essentially the same. 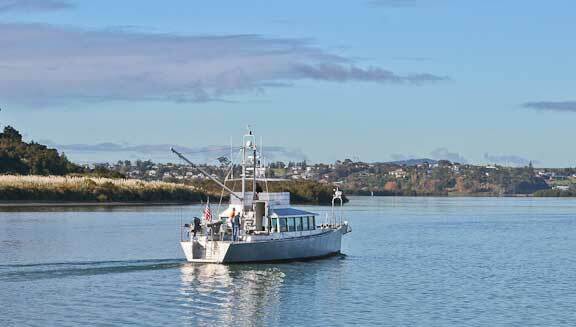 Todd Rickard is on his way to New Zealand for sea trials and we’ll have lots of detailed photos to share in another week or two. Have you considered a small array of flexible solar panels over the flying bridge awnings? Two fold intent, to provide a small power supply during cruising to contribute to electrical demands particularly extending at anchor time without gen set run. But more importantly to supple essential system power in the case of an engine system failure (most likely fuel problem) which would affect both propulsion engine and generator. Would be nice in the event of needing to use the get home sail that you could continue to use navigation systems and basic house and nav lighting on the long slowish trip home. We looked at solar array locations in the early design phase (standard for a our boats). 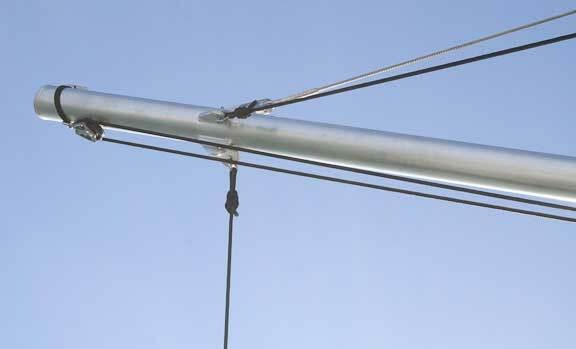 The main issue is shading from booms and antennae which substantially reduces output. 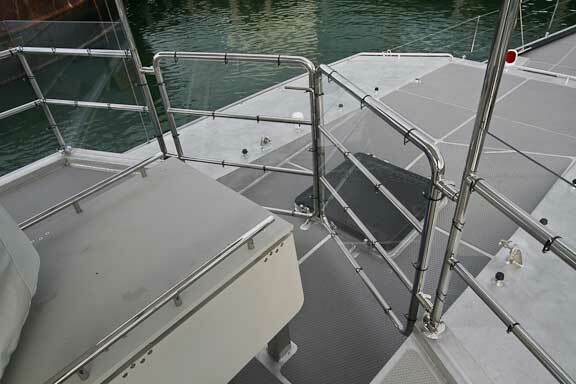 For the FPB 64 the best solar option is an array over the swim step. 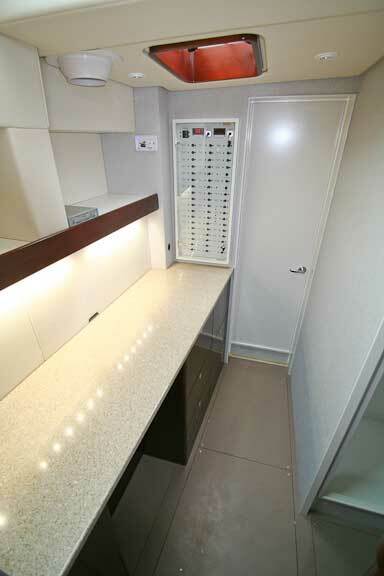 There are two inch/50mm pipe sockets all the way aft to be used for this purpose. Steve, I’m just now discovering your fpb-64 but have some awareness (and much admiration) of the original Wind Horse. Please speak to the topic of water intrusion at the upper helm for systems components and the helm structure itself. The flybridge helm’s main protection comes from the flybridge awning. The helm box, as we refer to it, has several pieces of gear, most of which are tolerant of weather/moisture. However, from a long term wear standpoint not all gear is highly water resistant (or proof) and so a canvas cover is provided to cover the box in inclement weather or when not in use. The main helm below is the desired steering station in these conditions. 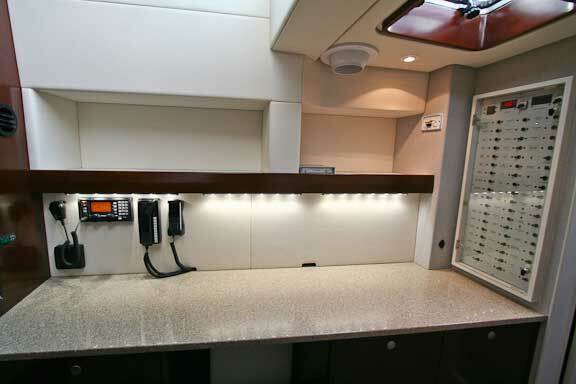 It is possible to fit Eisenglass or Strataglass (clear Polycarbonate) as surround curtains on the flybridge to more fully enclose the flying bridge area. 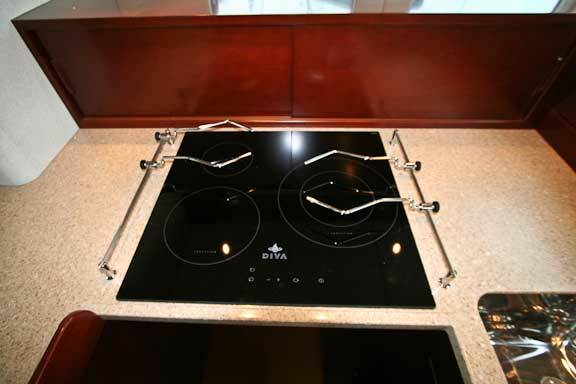 Can you share your source for the sea rails installed next to the induction stove?